We're being told the 2009 vintage for the wines of the Beaujolais region are the best ever. 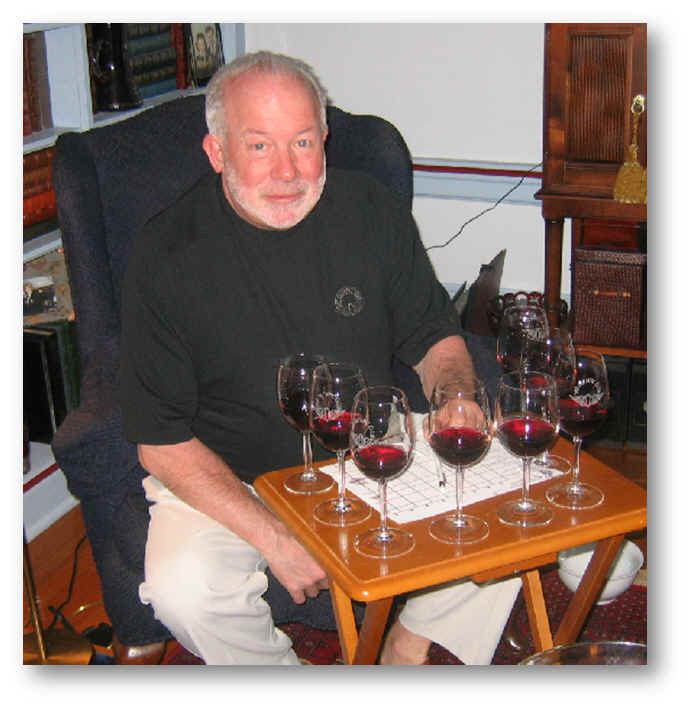 Georges Duboeuf is quoted as saying it's the "Vintage of a Lifetime." 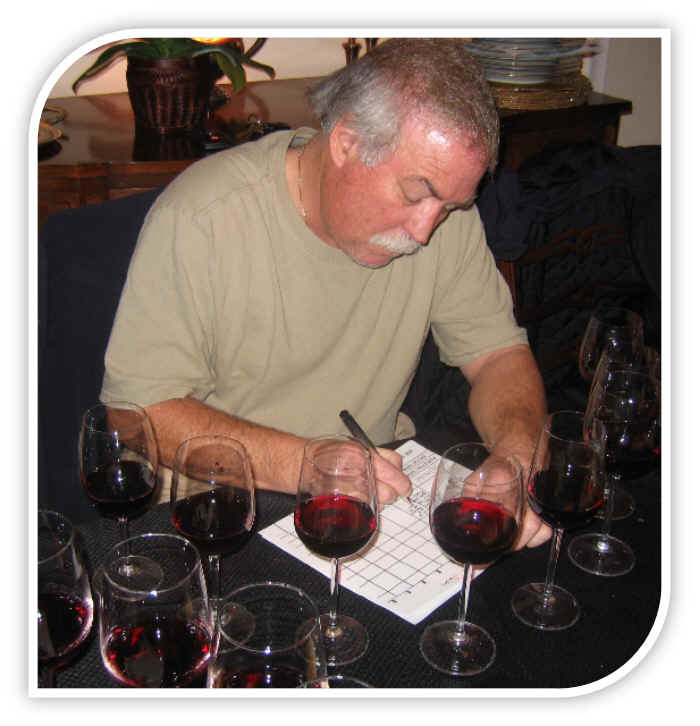 What makes 2009 different from other vintages? The vines flowered under good conditions in May and the growing season was reasonably warm and sunny all through the summer. The fruit attained a good level of sugar and maturity, meaning those selling sugar to winemakers for "chaptalization" had a tough year. It's not as though the region has experienced bad weather and difficult growing conditions for the past few decades, though. 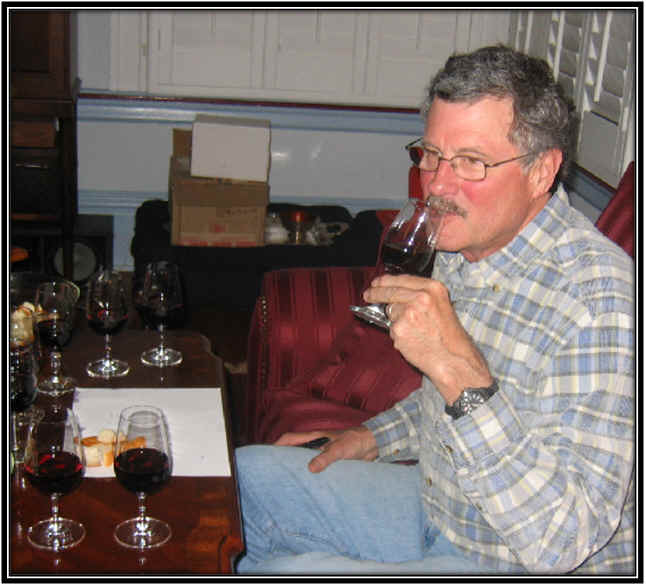 In fact, producers viewed 2008 as being quite good and promising in terms of quality and 2006 was characterized as "excellent" by many producers. Is 2009, then, significantly superior? The region had been stung by a sugar "scandal" and has been under scrutiny by local agricultural officials. 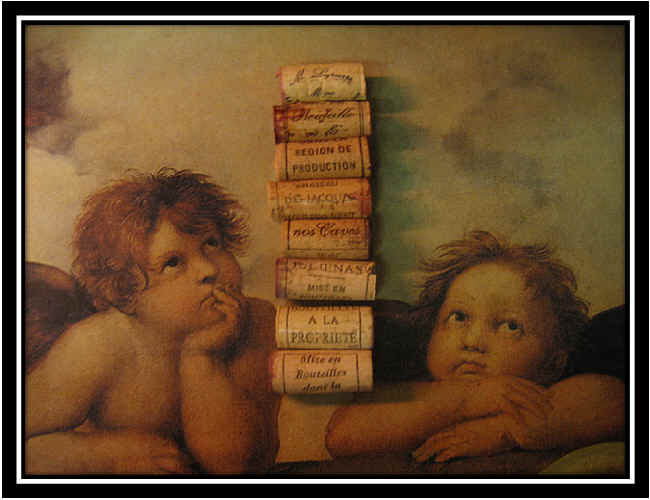 Some years ago a number of vintners were arrested in connection with purchases of bags of sugar which were added to juice to increase the alcohol level in various wines. A modest amount of this fortification, known as chaptalization, is permitted, but it seems some winemakers were going overboard with this. Reports alleged some "go-betweens" had purchased large quantities of sugar just outside the region and then had businesses of selling these to winemakers. What may make 2009 such a good vintage is the Gamay actually attained both good levels of maturity and sugar. Of course, top producers have made rather good quality wines through most of the past decade, but it seems in this vintage, a measure of quality was bestowed even upon those growers who pay less attention to quality. 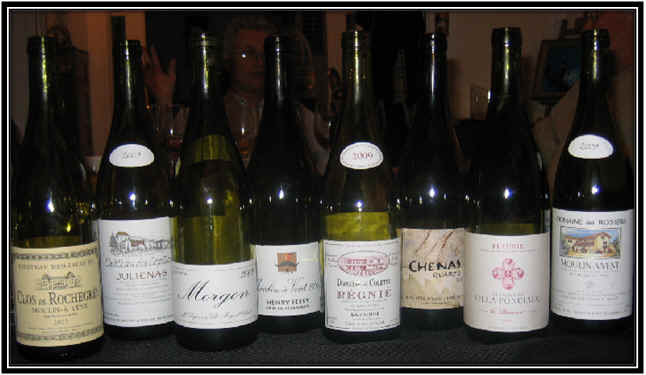 We assembled a group of 8 "cru" Beaujolais wines and selected domaines which seem to have an eye towards good quality. We purchased wines from various appellations and included a couple of domaine wines from George DuBoeuf. Monsieur DuBoeuf is often called the "King of Beaujolais" as his company sells a significant percent of the total production from the region. Many critics deride the DuBoeuf wines as a result. Overall, the wines were of good quality. Each had nice characteristics and there were no "poor" wines in the line-up. Two wines were a bit ahead of the pack and the remaining 6 wines were not separated by a huge disparity in point totals. Here's a brilliantly clear wine with medium ruby color...youthful. The fragrances are reminiscent of red and black cherries, fairly classic aromas for Beaujolais. The wine is dry and nicely acidic, with medium+ body. On the palate it's very fruity, nicely zesty and tangy with loads of red fruits. I gave this one and a half stars on my three star scale, no stars being an ordinary or average quality wine. The Henriot family which makes Champagne and runs the Burgundy firm of Bouchard purchased the Chateau Poncie in 2008. They've given it a Roman name and are seeking to make top quality wines there. And this wine was certainly of good quality and distinctively different from the other wines in the tasting. The wine was clear in appearance and medium+ ruby in color. The nose and flavors were decidedly different: cassis and blackcurrants! The herbal notes of Creme de Cassis were prominent and a bit different. The wine shows mild tannins and may develop into a very good wine with additional cellaring, though it's certain enjoyable now. One-and-a-half stars. 6th Place: PIRON-LAMELOISE 2009 CHENAS "Quartz"
Clear in appearance and bright ruby red in color, the Piron wine offered intensely berryish aromas. It's dry and nicely acidic on the palate, with medium to medium-light body. There's a touch of tannin to the wine, but plenty of fruit to balance it. It's a good wine and typical of Beaujolais. I gave it a one star rating. Though I ranked it last, I still found a number of positive attributes to this classic, easy-to-drink Beaujolais. The wine is bright ruby in color and clear. The aromas displays heaps of fresh strawberry fruit and it seems fairly dry on the palate. The wine is medium to medium-light in body. The flavors are perhaps a bit superficial, but there's no mistaking this for anything other than Beaujolais: strawberries with notes of pineapple, cherry and a citrusy tone. Classic. One star. Looking at my notes, I wondered why I ranked this one ahead of the Colette (above). The wine is clear in appearance and medium ruby in color. It's fruity to the point of having a candied aroma with overtones of bubblegum. It seems fairly dry or right on the edge, anyway. Medium bodied, this is rather fruity on the palate with just a touch of tannin. I gave it a half star rating. The late Marcel Lapierre made his final wine in 2009 and he's credited with producing a more "natural" style of Beaujolais. 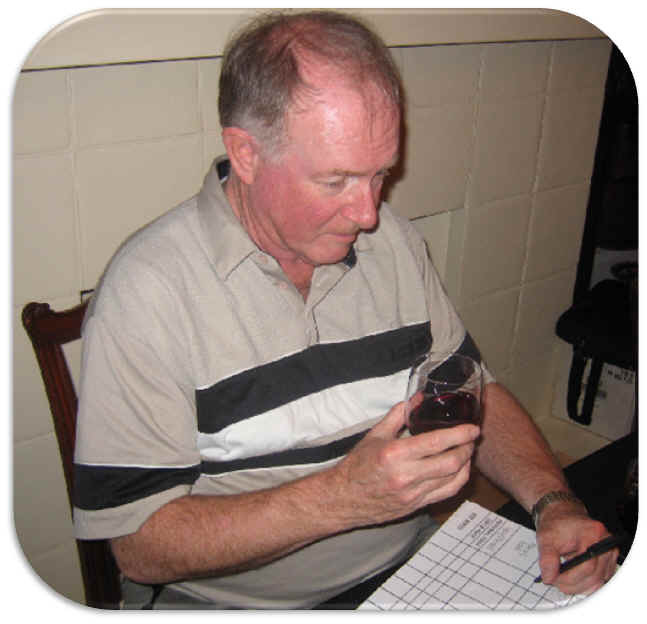 He had embraced organic cultivation in the vineyards long before that was fashionable and they also advocate minimal doses of SO2 in their wines. Light ruby in color, this was was clear in appearance. The nose was a bit subdued from the start and as it aired, I found some stewed fruit notes. Dry and moderately acidic, the wine is medium-light bodied. I went back a couple of times in tasting it and found a pronounced apple character which reminded me of some nice Calvados. It's quite distinctive and there are numerous fans for this wine and the domain. Others may simple tab it as "rustic," while others will find it simply odd. I was willing to give it a provisional one star rating, but it's certainly not modern Beaujolais. 2nd Place: GEORGES DUBOEUF 2009 JULIENAS "Chateau des Capitans"
With a brilliantly clear appearance and medium ruby color, this wine was teeming with lovely red fruit fragrances. It offers loads of cherry notes on the nose. Dry and nicely acidic, the wine is medium to full on the palate in terms of intensity, but not 'heavy.' One might even describe this as a bit "Burgundian," as it's a seriously good bottle of wine. Two stars+. 2009 MOULIN-�-VENT "Clos des Rochegr�s"
This estate was purchased years ago by the Louis Jadot winery and we've tasted their wine from time to time. Ho hum. But here's a stellar bottle of red wine which caught us by surprise. I'm certain some people will downgrade this for not being prototypical, carefree Beaujolais, but the fact of the matter is this is really good. It's a single parcel, apparently, and the fruit is vinified in a particular manner which yields a more complex wine. They de-stem two-thirds to three-quarters of the fruit and then do a cold soak for a few days. They do a submerged cap fermentation using indigenous yeast. Following the fermentation, the wine goes into new, one year and second use cooperage. Well, we found a brilliant appearance and medium+ ruby color. The wine displays a wonderful perfume with floral notes and some berry and cherry fruit. I found a woodsy tone and as it aired, the oak became more noticeable, but hardly obtrusive. This is dry and rather full-bodied. The oak is found on the palate but there's plenty of fruit and mild tannins, suggesting it might be cellared for 5-10+ years. I suspect it will be a wine which would stump the experts in a decade, as this is a world away from what most people expect when they think of Beaujolais. Two+ stars. 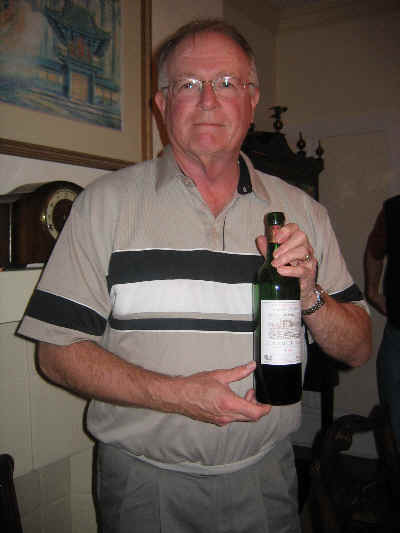 Our tasting host, John McGlothlin, treated us to a rather nice, well-aged bottle of "Mystery Wine" before the tasting. I found it to be somewhat reminiscent of a Cabernet-based wine and it turned out to be a St. Julien from the Bordeaux estate of Chateau du Glana. 1986, too. Holding up rather well.